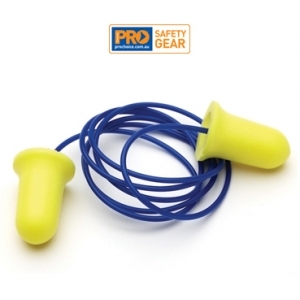 The disposable, PU foam ProPlug Bell Corded Earplugs provides hearing protection for noise levels up to 110dB(A). The brightly coloured ProPlug Bell shape disposable earplug delivers maximum comfort offering high visibility and worker compliance. With the new improved design it is easier to insert and reduces tendency to back out of the ear. Pairs packaged in individual poly bags. Qty/Box - 100 corded pairs.